In order to calculate the weight of an aquarium, you will need to take a number of factors into consideration. 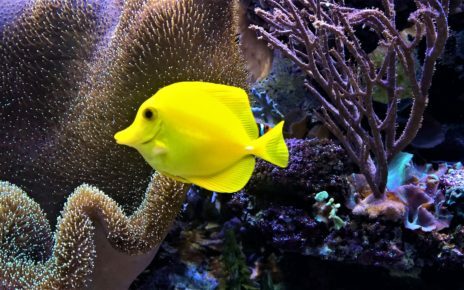 The largest contributor to an aquariums weight is, of course, the weight of the water, but one thing most people tend to forget is the weight of the substrate and the dry weight of the tank itself. In the following sections we have put together a guide of the weights of many standard sized aquariums, and we will also go over the weights of all the materials that make up a fish tank. 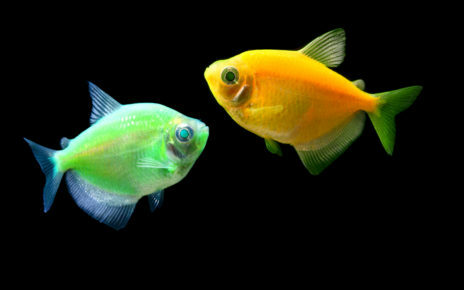 If all you want to do is quickly figure out the weight of your fish tank, you can use the aquarium weight calculator located above to find your answer. 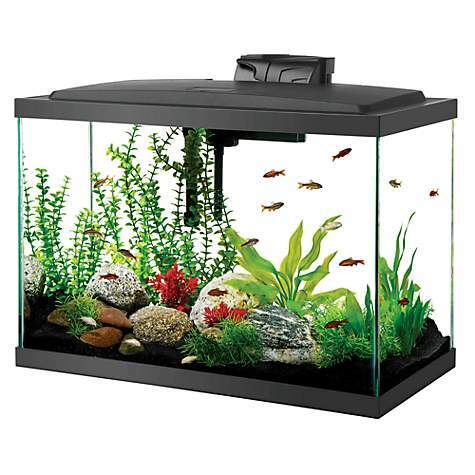 Your average rectangular 10 gallon glass tank that measures 20” x 10” x 12” will weigh about 94 pounds when filled to the brim with freshwater, or it will weigh 96 pounds if it is a saltwater tank. A 10 gallon acrylic tank, on the other hand, will weigh 88 pounds when filled with freshwater, and 90 pounds when filled with saltwater. 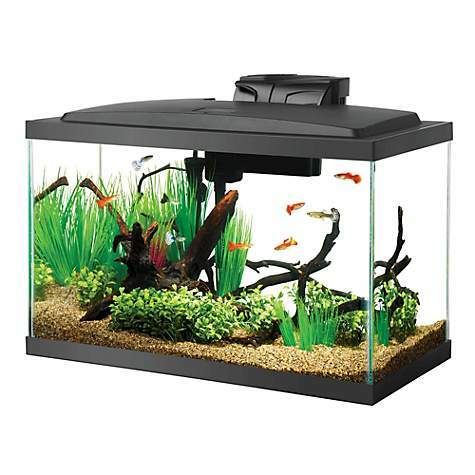 A 20 gallon glass fish tank that measures 24” x 13” x 16” will weigh approximately 177 pounds when filled with freshwater. The same glass tank, when filled with saltwater, will weigh 181 pounds. An acrylic fish tank with the same measurements will weigh 167 pounds when filled with freshwater, and 171 pounds when filled with saltwater. 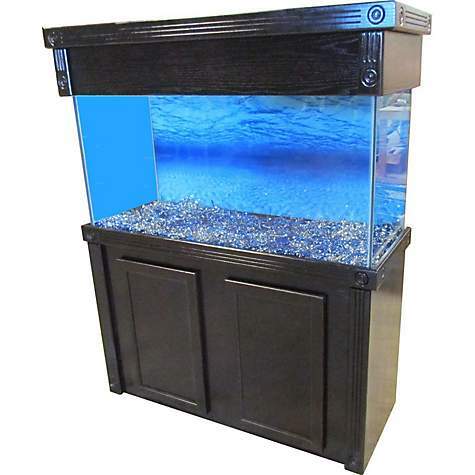 A 30 gallon glass fish tank that measures 36” x 13” x 16” will weigh 294 pounds if it is a freshwater tank, otherwise, it will weigh 301 pounds if it is a saltwater setup. A 30 gallon acrylic tank with the same dimensions will weigh 273 pounds when filled with freshwater, and 280 pounds if it is filled with saltwater. 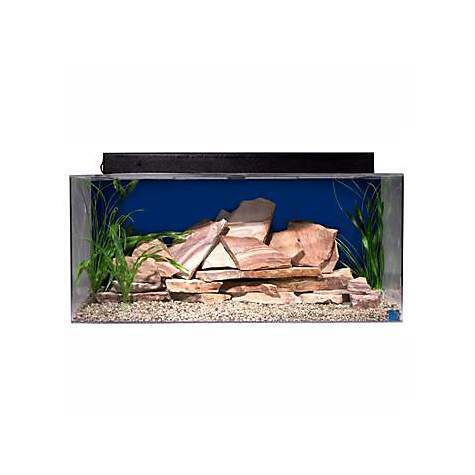 A 40 gallon glass fish tank that measures 36” x 18” x 16” will weigh 403 pounds when completely filled with freshwater. Otherwise, the same 40 gallon glass fish tank will weigh 412 pounds if it is a saltwater tank. If you have a 40 gallon acrylic tank with the same dimensions, then it will weigh 378 pounds when filled with freshwater, and 387 pounds when filled with saltwater. A standard glass 55 gallon fish tank that measures 48” x 13” x 20” will weigh 487 pounds if it is filled with freshwater, and it will weigh 498 pounds if it’s a saltwater tank. 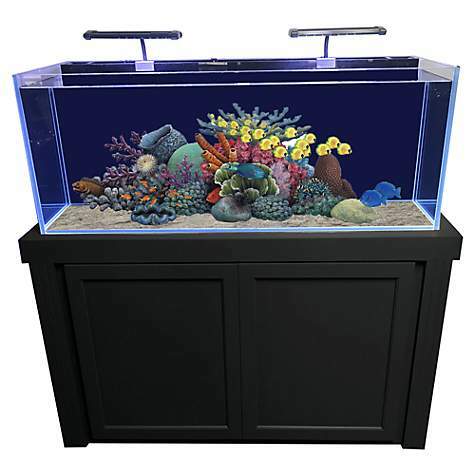 A 55 gallon acrylic tank with those same standard dimensions will weigh 455 pounds when filled with freshwater, and 466 pounds when it is filled with saltwater. 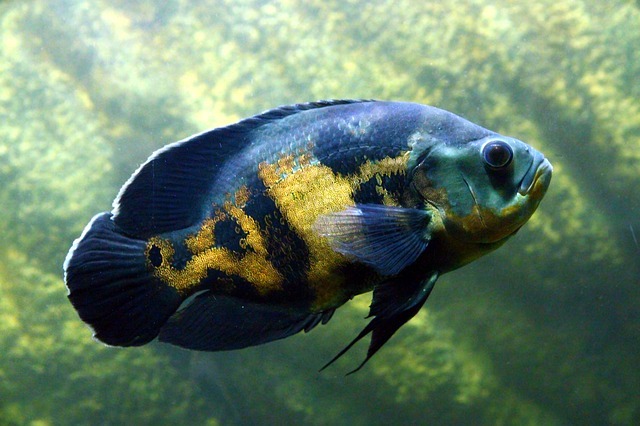 If you have a 60 gallon glass fish tank that measures 48” x 13” 24” it will weigh 583 pounds if it is a freshwater tank, and it will weigh 596 pounds if it is a saltwater tank. 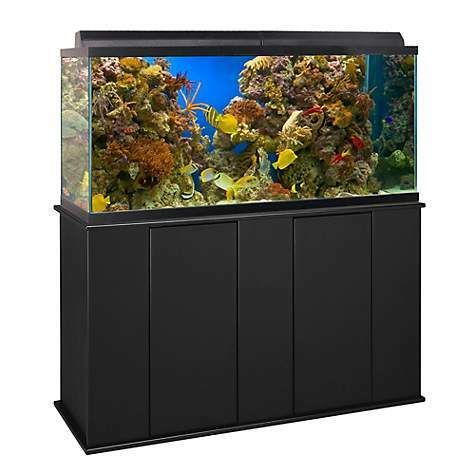 A 60 gallon acrylic tank with a similar profile will weigh 454 pounds in a freshwater configuration, and 558 pounds if it is a marine tank. A 75 gallon fish tank that is made of glass and measures 48” x 18” x 21” will weigh 699 pounds when it is used to keep freshwater fish. Otherwise, a 75 gallon glass fish tank will weigh 715 pounds when it is filled with saltwater. A 75 gallon acrylic tank of the same dimensions will weigh 660 pounds when filled with freshwater, and 676 pounds when filled with saltwater. 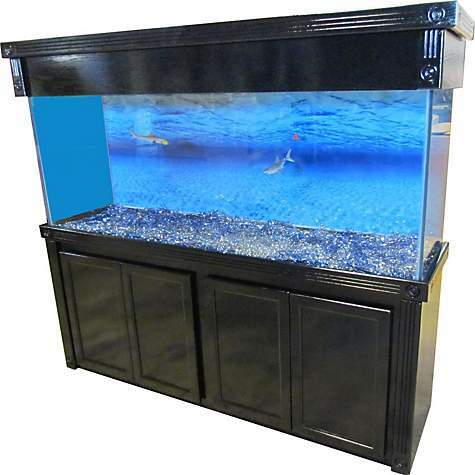 A standard glass 90 gallon fish tank that measures 48” x 18” x 24” will weigh about 797 pounds if it is a freshwater tank. Otherwise, the same 90 gallon glass tank will weigh 816 pounds when it is filled with saltwater. A 90 gallon acrylic tank with the same dimensions will weigh 754 pounds if it is filled with freshwater, or it will weigh 773 pounds when it is filled with saltwater. 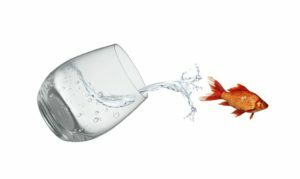 If you have a glass 100 gallon fish tank that measures 60” x 18” x 20” then it will weigh approximately 831 pounds when it is completely filled with freshwater. 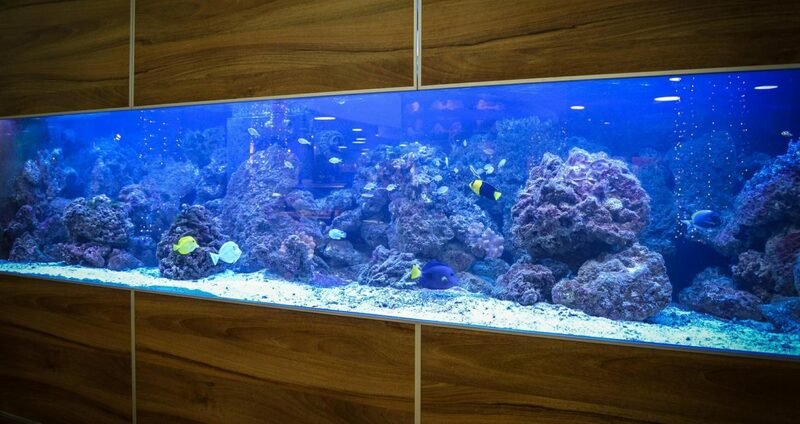 The same 100 gallon glass fish tank will weigh 850 pounds if it is filled with saltwater. A 100 gallon acrylic tank with similar measurements will weigh 786 pounds if it is a freshwater tank, and 805 pounds if it is a marine tank. 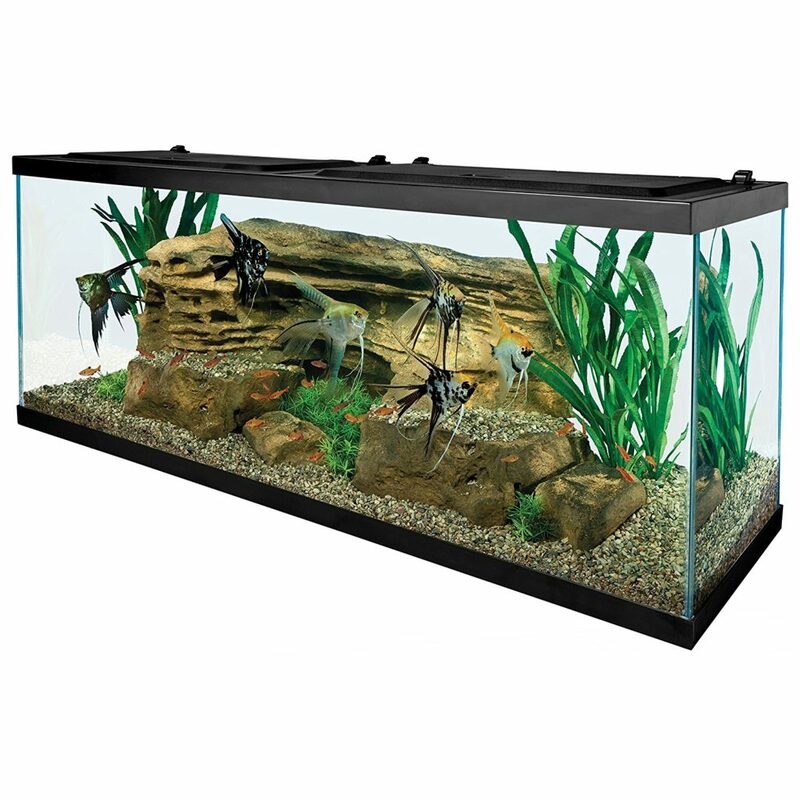 A standard glass 120 gallon fish tank that measures 48” x 24” x 24” will weigh approximately 1,054 pounds when completely filled with freshwater. Otherwise, the same glass tank will weigh 1,079 pounds if it is filled with saltwater. A 120 gallon acrylic fish tank with the same measurements will weigh 1,005 pounds if it is filled with freshwater, or it will weigh 1,030 pounds if it is filled with saltwater. A glass 125 gallon fish tank that measures 72” x 18” x 20” will weigh 995 pounds when it is completely filled with freshwater. The same 125 gallon glass tank, on the other hand, will weigh 1,018 pounds if it is a saltwater tank. An acrylic tank with the same dimensions will weigh 942 pounds if it is filled with fresh water, otherwise, it will weigh 965 pounds when filled with saltwater. A large glass 150 gallon fish tank that measures 72” x 18” x 27” will weigh a total of 1,337 pounds if it is filled with freshwater. If instead the same 150 gallon glass tank is filled with saltwater it will weight 1,369 pounds instead. 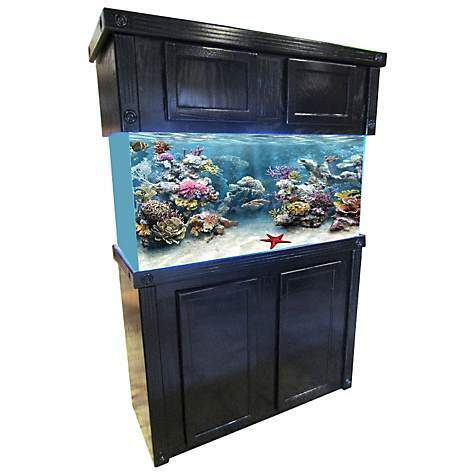 A 150 gallon acrylic tank with similar dimensions will weigh 1,271 pounds in a freshwater configuration, and 1,303 pounds when it is set up as a marine tank. 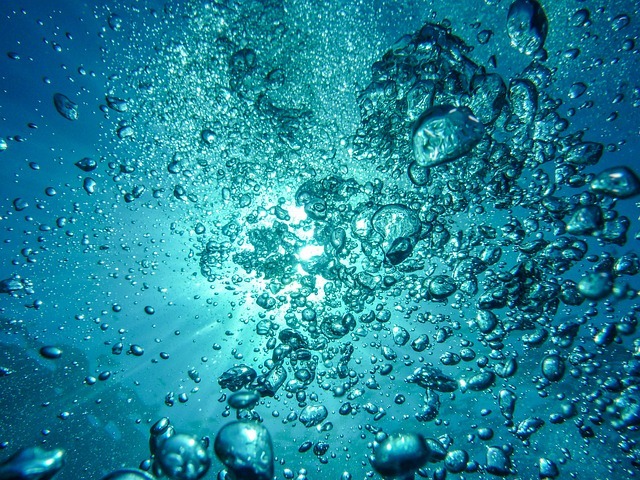 The volume of water inside an aquarium will make up the majority of an aquariums weight. 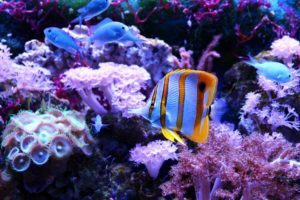 The main thing you will need to consider when determining the weight of the water in an aquarium is if it is a freshwater or saltwater tank. 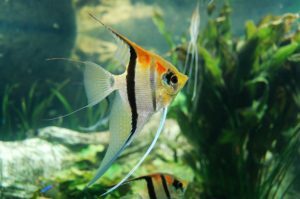 If you plan on keeping a freshwater aquarium, then the weight of the water will be a little bit less than it would be for a saltwater tank. 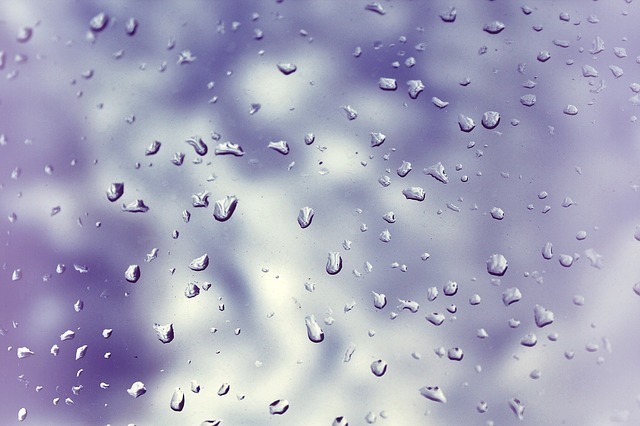 In general, the weight of pure water with no dissolved solids is 8.33 pounds per gallon. Of course, everyone’s water quality will be different, so the exact weight of your water might vary by a small amount. 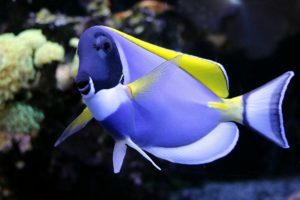 A saltwater aquarium, on the other hand, will weigh a little more due to the weight of the salt that is dissolved in the water. The weight of saltwater with a specific gravity of 1.027 is 8.55 pounds. As long as you keep your salinity levels in your aquarium stable, then this number is about as precise as you are going to get. One thing most people tend to ignore when they calculate the weight of their tank is the weight of the glass. If you really want an accurate measure of and aquariums weight you really can’t ignore the glass. 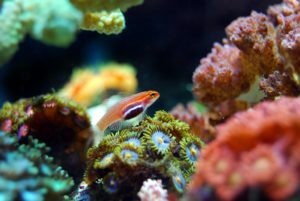 In some cases especially with small aquariums, the weight of the glass alone can make up 10% of the overall tanks weight. 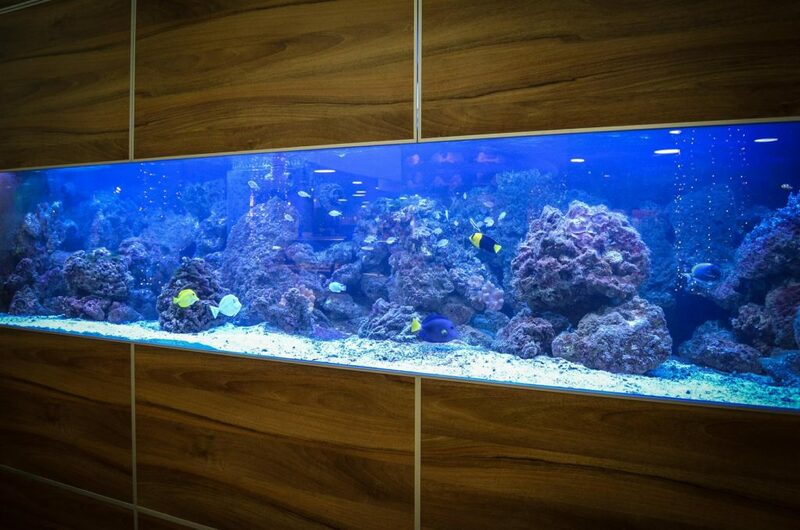 The weight of standard glass used in most aquariums is about 0.091 pounds per cubic inch. Some aquariums are made with low iron glass, in that case, the density of the glass will be a little bit lower but not by that much. While acrylic tanks might weigh less than their glass counterparts the acrylic will still add to your aquariums total weight. For the most part, the weight of the acrylic can make up a little more than 5 percent of the total weight of a small to medium sized tank. 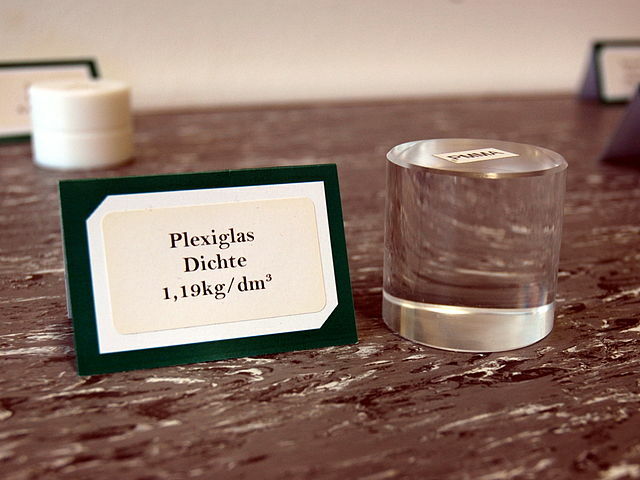 The weight of pure acrylic is 0.0426 pounds per cubic inch. That means acrylic has a density that is more than 50 percent less than the equivalent volume of glass. Acrylic also tends to be a purer substance so its measured density can be taken as a more precise figure versus glass. 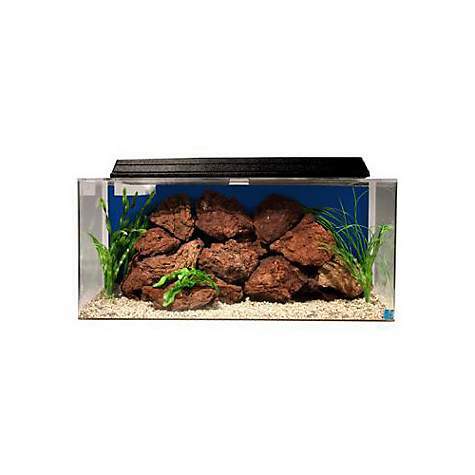 If you plan on adding a gravel substrate to your aquarium, it will also add to the weight of your tank. If you know how many pounds of gravel you added when you set up your aquarium, then it should be easy to figure out how many extra pounds it adds to your tank. Otherwise, if you only know the depth of the gravel then you can use the density figures below to help you out. Pea gravel is one of the most common types of gravel used in a fish tank. The density of pea gravel is 0.065 pounds per cubic inch. Most gravel you find at pet stores tends to be pea gravel, so if you don’t know what type of gravel you have it’s most likely pea gravel in your tank. Regular gravel is coarser and the individual pieces are less polished, and they tend to have an irregular shape. 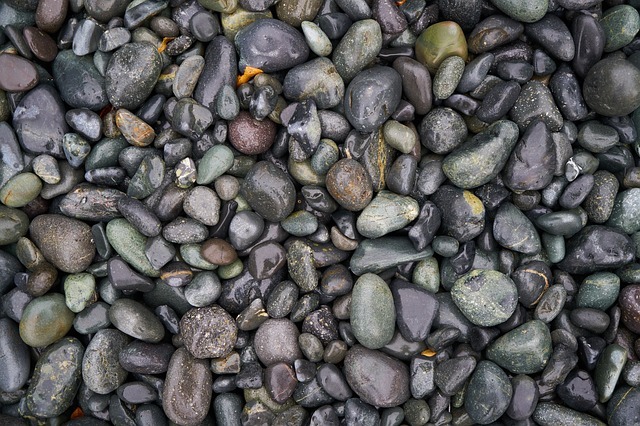 The average density of regular gravel tends to be about 0.049 pounds per cubic inch. This lower density is mostly due to the fact that the larger pieces of gravel have less ability to pack together tightly due to their irregular shape. 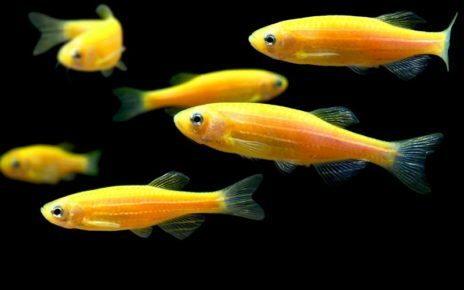 If you are using dolomite as your substrate for fish that prefer a higher pH, then, in that case, you will be dealing with a little more weight. The density of dolomite gravel is approximately 0.067 pounds per cubic inch.